The text below is an edited excerpt from MPP/MARN founder Kat Albrecht’s book DOG DETECTIVES: Train Your Dog to Find Lost Pets. How Long Can Scent Survive? There are many opinions and claims regarding just how long a scent trail can last. Missing Animal Response Network posts this information because some pet owners are hiring pet detectives who claim that their dogs can track a scent trail that is several months old and even up to a year old. Kat Albrecht has spent over 20 plus years training and working search dogs, observing other search dogs in training, and learning from search dog authorities across the country. She’s familiar with aged trail experiments performed by experienced Bloodhound trainers. Based on her knowledge of what other credible Bloodhound handlers have experienced, her training through the National Police Bloodhound Association (NPBA), and her personal experience in working successful cases with search dogs that she has personally trained and/or worked with, she is comfortable in estimating that in optimal scent conditions (cool, damp areas with heavy vegetation and no wind) a trained trailing dog is probably capable of following a scent trail that is up to three (possibly even four) weeks old. Keep in mind, however, that even if the scent trail is too old for a search dog to track, a MAR Technician can POTENTIALLY HELP YOU find your lost pet using other methods, including using his or her dog to track a fresher scent trail from a viable sighting. “The ideal working scent conditions for a trailing dog are cool, moist days with no wind. Scent will pool, cling, and survive in shady areas and areas with lush vegetation. The moisture provided by lush green grass, the shade of a front porch, or the damp surface of a gutter are all examples of places where residual scent could be present several days after the source of the scent has passed through an area. Scent survives longer in the cooler conditions found in the evening or early morning hours because lower temperatures will tend to bring the scent back down to ground level. Hot and dry conditions have a negative impact on scent survival. In these conditions, scent is more easily dispersed and destroyed. Direct sunlight will dry out and quickly destroy scent vapors. In addition to the physical toll that it can take on a trailing dog, heat can also cause scent to rise above the level of where the dog is working. The key to working a search dog in hot temperatures is to avoid it if you can. Wind can disperse scent great distances, minimizing a scent trail and making trailing difficult. 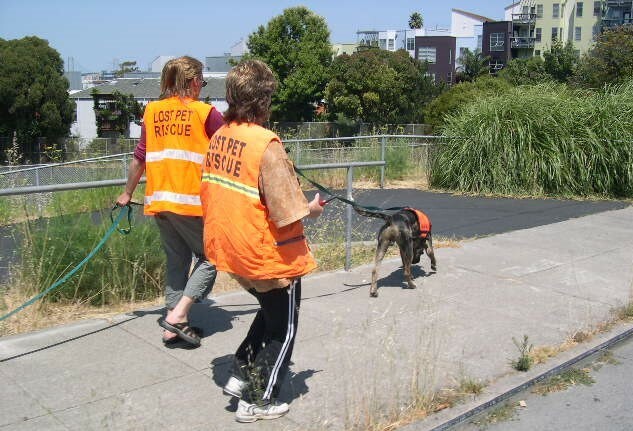 In a case where a lost person walked down a sidewalk four days prior to a trailing dog starting to search, the trailing dog might very well work by dipping down into the driveways, up to front porches of homes rather than the spot where the person walked on the sidewalk four days before. If there is grass directly next to the sidewalk, then the trailing dog might work on the grass. The chances of any scent remaining directly on the pavement of the sidewalk are slim after a four-day period. But the chance of scent surviving by clinging to the moisture provided on the grass and in the shady areas is very likely. Scent needs moisture to survive which rain provides. Rain does not make scent mysteriously disappear. Rain will not destroy scent, but a heavy downpour on pavement can disperse it, making it difficult to follow a trail. In those cases, the scent will cling in gutters and puddles instead of being dispersed along a consistent path like a sidewalk. So How Long Can Scent Survive? The odor of decomposition has been known to change the composition of soil and can be detected by search dogs many years after the body decomposes down to skeletal remains. For obvious reasons, the longer you wait to have a search dog track a scent trail, the less likely that dog will be able to work the scent trail successfully. The longer you wait, the more likely the lost dog will have moved or been transported a great distance. Thus, the fact that the scent of the missing dog might still be present after seven days is sometimes a moot point if the dog has already traveled 20 miles and you aren’t able to catch up to him or her. This is why Missing Animal Response Network is pushing for community-based lost pet services. Ultimately, we want to see the rapid response of MAR trailing dogs who can respond within hours or a few days to search for lost dogs in their own community. Keep in mind that a two-week-old scent trail laid in a residential area that is highly contaminated with other animal scents and dispersed with vehicular traffic is much more difficult to work than a two-week-old scent trail laid in the depths of a cool, damp forest thick with vegetation. Scent has a better chance of surviving in shady, damp, and cool areas than it does in open ground or pavement where it is easily moved by wind currents, swirled around by passing cars, and ultimately dried out and destroyed by direct sunlight. Although no one knows exactly how many days a scent trail will be viable, we can make estimates based on prior successes of cases worked by police Bloodhounds and search-and-rescue trailing dogs who have made actual walk-up finds. The majority of successful scent trails where these dogs actually found the lost person or criminal were basically hours or a few days old. The oldest documented scent trail that we could uncover in our research is detailed in the book The Complete Bloodhound by Catherine Brey and Lena Reed. The authors write about how “a new record in mantrailing was established” when a Bloodhound handler named Norman Wilson and his three Bloodhounds (Doc Holiday, Queen Guinevere, and Big Nose Kate) successfully tracked a scent trail of three missing people lost in the “wet, dense forests of Western Oregon.” By the time Wilson worked his hounds, the scent trail was 322 hours (thirteen days) old. His hounds led Wilson to the bodies of the missing hikers. We’ve heard of tracking authorities who believe that a scent trail vanishes once a person walks on pavement and others who believe that a scent trail dissipates after eight hours. At the other end of the spectrum, there are currently a few pet detectives who claim their search dogs can track a lost pet scent trail that is several (five) months old. There is even a pet detective who claims that a specific trailing dog can track a lost pet scent trail that is up to a year old! For decades trailing dogs handled by volunteers and law enforcement officers have only been capable of following scent trails that are less than two weeks old and yet suddenly, people charging a fee for their pet tracking services are miraculously able to train dogs who can track scent trails that are months old. While making such claims opens the door for more business revenue (it enables them to respond on searches where the lost dog has been missing for months), these types of seemingly exaggerated claims put MAR work and the pet detective industry in jeopardy of being dismissed as “a scam” by scent dog industry professionals who understand the fragile nature of scent. If you still have questions, please feel free to contact us through our Contact Page and a Lost Pet Professional will respond to your question. Interested is Training Your Dog? Visit our MAR Search K9 Training to learn more about how you can give your dog a job searching for missing or lost pets. All MAR K9 Courses require you to first take our MAR Field Course before moving on to the K9 courses. Register For Your Missing Animal Response Training Course Today!